Northern Province Governor Suren Raghavan has undertaken an observation visit to the Iranamadu Tank today (18). The purpose of this observation visit was to look into the current condition of Iranamadu Tank and implementation of the decisions taken during a previous observation visit at the tank on January 10. The chief irrigation engineer and other officials who had joined the visit informed the governor that the repairs to the tank can be completed by the 31st of January. Furthermore, it was revealed during the visit, that only 40 percent of the water capacity of Iranamadu Tank is used for agricultural purposes, however, the remaining 60 percent flows into the sea without being used. Accordingly, Governor Suren Raghavan has instructed the Deputy Director of the Department of Irrigation of Northern Provincial Council Eng. 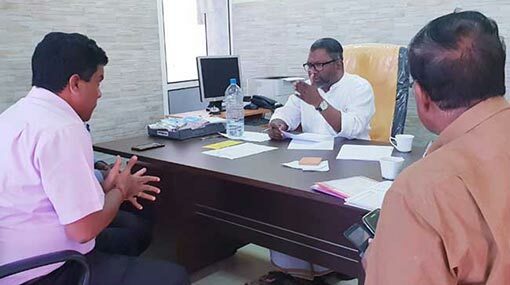 Navaratnam Suthakaran to prepare a project proposal on supplying the water of the tank that flow into the sea for the use of people living in Jaffna.